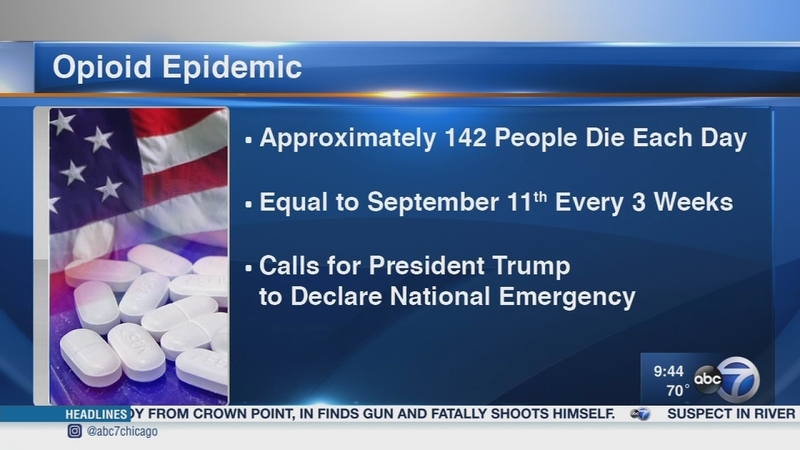 CHICAGO (WLS) -- The country has an opioid epidemic: Approximately 142 people die each day from overdoses. A presidential commission says the death toll is equal to September 11th, every three weeks. That commission is urging President Trump to declare a national emergency. And the Chicago area is not exempt from this crisis. But there are people fighting back: working to educate young people, get Narcan in the hands of first responders and even implement programs that allow those struggling with addiction to go to police and ask for help. Two people on the front line of this fight, Dr. Kathleen Burke. the director of substance use initiatives in Will County and Lake County State's Attorney Michael Nerheim. For more information on the programs discussed, visit www.willcountyillinois.com, www.awayoutlc.org and www.opioidinitiative.org. The country has an opioid epidemic: Approximately 142 people die each day from overdoses.